The strength of this book is that it comprehensively covers all aspects of being a stay-at-home mom from settling on a job to do to maintaining your household, relationships, and physical health. 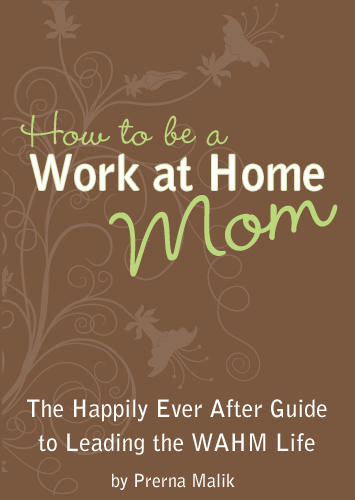 The first chapter helps women explore work at home options as well as how to avoid scams. Malik shares the job boards and websites she uses to find jobs, which is helpful. Clearly, this section is not the main focus of the book; the information is just meant as a springboard for women to come up with their own ideas. I would have liked to have seen this section go into further detail and offer more potential jobs and the steps to begin working in these jobs. Coming up with a workable business idea is often the hardest task, and this chapter could have been a bit more comprehensive to help women generate more ideas. This section is all about the money--how much to charge for your work as well as how to budget for your business. Malik also explains how to set up and organize your home office (even if your dining room table is your office for now) as well as how to create a network of supporters. Work at home moms may often find themselves distracted from their work so they can do dishes, tidy up the house and cook dinner. Malik has been there and done that, so she gives suggestions for ways to keep the home humming while not taking you away from your work prematurely. This is an area that many WAHMs struggle with, so Malik's advice is welcome. Her suggestions for ways to keep kids occupied when you do your work is also valuable. Networking and advertising your business are essential to job growth, and Malik covers a number of different strategies you can use. This chapter is valuable both to those who are new to working at home as well as those who have been doing it for some time. Malik reminds women that even though you work from home, it is still important to dress for the day (no staying in pajamas all day!) and to exercise and stay fit. Doing so will help you be more productive. There is no boss looking over your shoulder when you work at home; getting distracted by surfing the web is all too easy. Malik gives sound strategies to stay focused and get your job done, giving you time to spend with your family. This is another important chapter for most women. Whether you are an experienced WAHM or a newbie, Malik's 5 ways to pitch new clients as well as her sample pitch letter are some of the most valuable tools in this book. Use these strategies, and you will grow your business. She also shares free ways to market your business as well as discussing whether or not you need to pay for advertising. Someone who has been working in a bustling office may struggle with the solitary work at home environment. Malik addresses this issue as well as ways to keep your productivity high. Chapter 8 is, in my opinion, one of the most valuable chapters in the entire book. Malik interviews Angela England, editor-in-chief of Blissfully Domestic; Heather Allard, founder of The Mogul Mom; Karen Gunton, owner of Build a Little Biz; and Linsay Chavez, owner of Busy Mom Boutique. Hearing these womens' struggles as well as their successes and the steps they have taken to make their business work is important for women who are WAHMs or are considering becoming WAHMs. This last section includes all of the forms and ideas you need to make your WAHM business run smoothly. The ebook is available for $19. However, it does occasionally go on sale. The information on pitching new clients makes this book worthwhile by itself. Using her pitch strategies, you should be able to land some new clients that net you much more than the $19 you pay for this ebook. 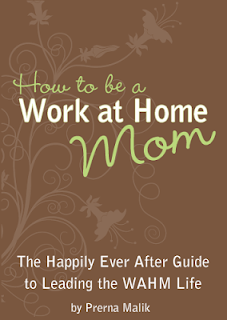 This ebook will likely be of great value to a woman who is contemplating being a work at home mom or who has just made the leap. While the experienced work at home mom won't find as much value in the book, there are still sections that make it a worthwhile investment. Purchase this ebook here! Wanna Win? We are giving one lucky reader a copy of this book! Enter here before October 8th, 2015!